Farmers in Mahoba district of Uttar Pradesh know at least one person they can count on in times of doubt or crisis. Manoj Kumar, 30, has been working with farmers for eight years, travelling to villages, discussing their problems, advising them on matters of farming and finance. These days he is getting lots of calls from farmers in distress. The wheat-sowing season is at hand but farmers are finding it tough to get cash, fertilizers and seeds. Seven farmers killed themselves in Mahoba in October, and some of them were among those whose debts were waived by the centre, said Kumar, coordinator of the Mahoba chapter of Bun- delkhand Aapda Nivarak Manch, an association of ngo s, farmer groups and civil society organizations. Parmanad Khushwaha, 45, burnt himself at night.He was unable to get a loan from either banks or moneylenders, so he could not buy fertilizer and seeds for his three- hectare (ha) farm in Srinagar village. Narendra Kumar, 40, owned 2 ha in Chandauli village and was regularly repaying loans, but this year he got no money to buy fertilizer. He consumed pesticide. So did Munna Lal Richaria, 55, of Panwari block and Pyare Lal, 45, of Mahoba block. Some of these cases were reported in the media, though Mahoba's Superintendent of Police R P Singh and District Magistrate V V Pant said they had no knowledge of the suicides. In neighbouring Hamirpur district, the police lathicharged farmers protesting shortage of fertilizers and seeds on October 16. In Lalitpur district, cooperative societies have refused to give fertilizers and seeds even to those with cash unless they repaid their outstanding dues. These farmers have no option but to turn to the black market. Conditions are particularly distressing in southwestern Uttar Pradesh, part of the Bundelkhand region, where exc ess rains this monsoon destroyed crops. This came after four years of drought-like conditions in this semi-arid plateau. Waterlogged fields meant yet another wasted year and those who managed to sow pulses lost them to rains. Just like the monsoon, Rs 72,000-crore loan -waiver scheme of the centre has not served the farmer. The government claimed it would salvage the farmer by making credit easily available. What is happening is quite the opposite. Banks are hesitant to lend money to farmers. They suspect the waiver will encourage more farmers to default. Some officials in banks' rural branches in Baghpat district did admit on the condition of anonymity that there was hesitation among bankers to lend. They said the banks were scrutinizing applicants' land records and credibility even more carefully. "If a farmer is a habitual defaulter, we have tried to steer clear of him. We are slightly lenient to those who have been somewhat regular. But the general sentiment is that of hesitation and restraint," said the field officer of a Syndicate Bank branch in Baghpat. Soon after the loan waiver was announced, economists, banks and consultancy agencies had predicted this situation. Associate director of consultancy firm PricewaterhouseCoopers, Robin Roy, had warned that the waiver would vitiate the credit culture and make loan recovery difficult. The firm does consultancy for private banks. The scheme has vitiated the credit culture in more ways than one. In most parts of western Uttar Pradesh, the beneficiaries have not yet received loan waiver certificates they need for taking further loans. Inder Singh of Kanhari Kala village in Lalitpur has not received confirmation of his loan waiver. "No one in Punjab National Bank is ready to talk about the certificate. "It doesn't matter whether you had your accounts clean or you defaulted. Now all farmers are treated with suspicion"
"Every time I go to get a Kisan Credit Card, the bank manager tells me to come after a week or to bring some more documents"
All they have been telling me is to renew my Kisan Credit Card. They and middlemen take a cut for making a card," he said. 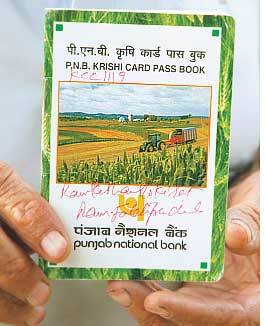 Prakash Lodhi of the same village had his Rs 50,000 loan written off. A Punjab National Bank account holder, he has been doing the rounds of the bank for months. "Sometimes they say the branch hasn't received any money and sometimes they say a new credit card has to be made," he said. Officials at the bank were not available for comments. Some banks, like the Triveni Kshet-riya Grameen Bank, are holding camps to distribute waiver certificates. "Still one needs a middleman. Many don't even know whether they are in the waiver bracket. They are shooed away by officials unless they come with a middleman," alleged Prithvi Singh, a member of the Bhartiya Kisan Union in Mahoba. Lodhi calculates that of the Rs 20,000 per acre (0.4 ha) he is eligible for under the national Kisan Credit Card scheme, he would have to shell out at least Rs 600 for getting his documents ready and for approving land records. One per cent each would be deducted for service charges, insurance and extra charges. He would have to shell out another 10 per cent for the middleman. Banks denied the charges. "We have distributed certificates and the distribution of loans is in full swing," said Digmanu Gupta, sbi's assistant general manager in Mumbai. Chief general manager of the national rural development bank nabard, A Ramanathan, asserted that certificates and loans were being given, as did the Syndicate Bank official. According to Kumar, a few branches of public sector banks issued some certificates under pressure from people's organizations, but cooperative banks were yet to begin the process. He alleged that some beneficiaries of the waiver, who had deposited a part of their drought relief in their account, were taken out of the loan waiver bracket by showing the money as loan repayment. This despite the fact that farmers got the drought relief in May, while March 31 was the cut-off date for the waiver. Economist Parmod Kumar of the National Council of Applied Economic Research in Delhi warned that lending would become more difficult given that banks do not have enough ready credit. "It seems the government's political gimmick will backfire," he said, referring to the waiver scheme. Farmers who can get 25 per cent of their loan written off under the debt relief scheme also risk turning defaulters. These farmers have to repay 75 per cent of their loan by June 2009 in three instalments. "But in Bundelkhand farmers will be unable to pay any instalment until April considering poor crops in the past three-four years. Unavailability of fertilizers and seeds could aggravate the situation," said Kumar. "Before the rabi season (October-March), we could have sown some pulses, peas, mustard and potato. But the season is gone trying to arrange for fertilizers and seeds," said Lodhi of Kanhari Kala who owns 1.2 ha and has a family of six to support. Lodhi sowed groundnut on half a hectare the previous season, but that is not sufficient. He needs money to cultivate the rest of his land. Cooperative societies have turned their backs on Lodhi and many like him. Till last year, members of cooperative societies could get fertilizers on credit. "But this year they have asked us to pay our outstanding dues. They are refusing to give fertilizer for cash either. Our crops have failed. How do we get money to pay back our loans?" asked Inder Singh who owns less than a hectare and owes just Rs 1,000 to the Talbehat Cooperative Society. Getting loans from a bank at a short notice is tough but Inder Singh and Lodhi realize that the once easily accessible moneylenders too are hesitant. "Most of us haven't repaid them. They've become wary of us. If they do agree to lend, the interest is huge (25-60 per cent)," said Lodhi. With societies refusing subsidized fertilizer on credit, farmers are forced to buy diammonium phosphate (dap), essential while sowing, in black at double the rate, that is at Rs 800 for 50 kg. Farmers are selling part of their assets to make ends meet. An official of the Fertilizer Association of India accepted shortage of fertilizer, especially dap in many areas. "The Mahoba district administration and the agriculture department failed to draw a proper estimate of demand," said Kumar. In Mahoba, he explained, fertilizer was available for cash to members of cooperative societies, unlike in Lalitpur, but poor farmers had to wait for days. If they had already prepared their farms, the delay spoiled the effort. Kumar alleged that the pay back condition was a sham and cooperative societies "are hand in glove with private dealers and at night they sell them their stock for a margin of Rs 50 to Rs 100". Seeds are also in short supply. Wheat seeds are available with societies and block offices for Rs 16,000-20,000 a tonne. "Had there been a good crop last year, it would have been available among farmers for Rs 10,000 a tonne," said Jalaun's Shiv Mangal Singh, a member of Parmarth, an ngo working among farmers in the state. Mahoba farmers have requested the district administration to let them buy seeds from godowns. "It takes a long time for seeds to reach farmers through cooperative societies. And once they reach they are usually distributed among those close to the people involved in distribution," Kumar said. Scarcity of diesel and electricity has hit irrigation. "The government should have cleaned the dams before rains. Only 40 per cent lakes in Mahoba have water," Kumar said. Sugarcane growers in western Uttar Pradesh are aware of the impending problem. Most of them sow wheat in November-January. "Fertilizer is available now but the problem will arise once demand increases," said Yashveer Singh, a sugarcane grower in Kishanpur. Will these farmers get a better deal?